Hundreds of thousands of One Million Acts of Kindness stickers are scattered about the globe. I love coming across one as I travel the country. 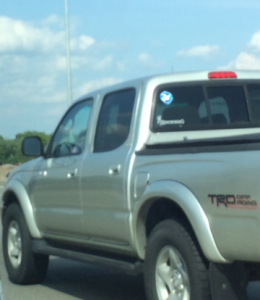 Just seeing this, got me thinking of how many people might have seen this individual sticker in the truck’s rear window. Multiply that number by hundreds of thousands, that is a very big number! This entry was posted on Thursday, June 4th, 2015 at 9:32 am	and is filed under Kindness. You can follow any responses to this entry through the RSS 2.0 feed. You can leave a response, or trackback from your own site.